No Bake- don’t you just love no bake cakes! Ok so this does contain a little sugar but the difference compared to the cakes on the shop shelves at Christmas is huge. 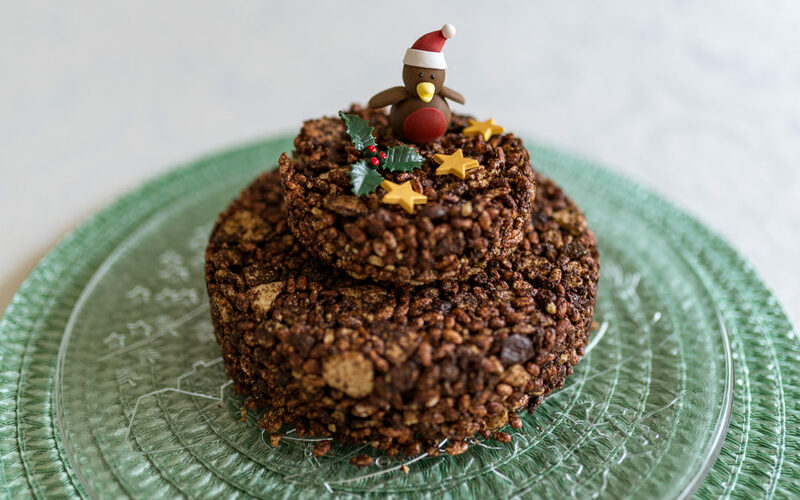 This contains much less refined sugar and seeing as the whole of December seems to be about treats and chocolate for Christmas, this is a good one for getting out for any December play dates and the children will love helping to make it. Firstly using your hands break up all the oatcakes into a large bowl, they should be small pieces, try to avoid too many crumbs. Next add the rice puffs and mix well. To melt the chocolate, you need a bowl that will fit on top of the saucepan, fill the saucepan ¼ way up and bring to the boil, place the bowl on top. Break all the chocolate into chunks and place in the bowl. The water should not touch the bowl. Pour the chocolate over the oat and rice mix; keep mixing until everything is covered with chocolate. Now add the cranberries and honey and mix again. Pour the mixture into the tins, (leave a small 1-2 cm gap at the top of the larger cake tin) use the back of a large spoon or spatula to flatten the mixture into the tin, take a few minutes to do this as it will really help the cake set evenly. Place in the fridge for at least 2 hours or until completely set. Use a sharp knife to cut through it when serving. You could melt the chocolate in a non-stick saucepan on very low heat but you will need to stir it constantly and watch that is doesn’t burn. This will keep well in the fridge for 5 days. Serve straight from the fridge, the lack of sticky sugar means it can fall apart easily at room temperature. Not suitable for freezing. My daughter even tried these ones and had to admit to liking them. They don’t take very long and they are really tasty! 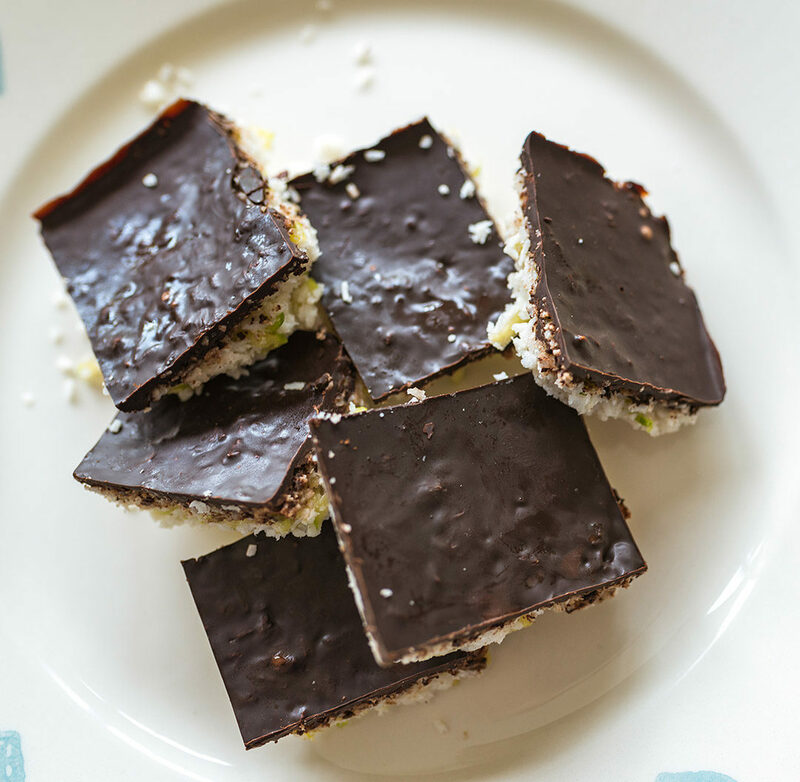 The squares are a healthy alternative to a chocolate treat, the added courgette with the coconut gives it a good kick of nutrients in every bite! The children really enjoy making these. Line a 20cm square baking dish or cake pan with baking paper that reaches a little up the side to make it easy to pull out once set. Combine the coconut, courgette, coconut oil, honey and vanilla in a large mixing bowl. Press the mixture into the prepared dish and place in the fridge for 30 minutes to firm up. Meanwhile, melt the chocolate. Boil a little water in a small saucepan, then set a small heatproof bowl over the top of the pan, ensuring that the bottom of the bowl does not come into contact with the water. Break the chocolate up into small squares and rest it on top of the bowl. Once the chocolate has melted remove it from the heat. Let chocolate cool for a few seconds before pouring it over the set coconut mixture. Use the back of a metal spoon to spread it evenly across the dish, then chill in the fridge until set (at least 30 minutes). Once set, turn out of the pan onto a chopping board and chop into 16 squares with a sharp knife. Tip: You could also make the mixture into individual desserts by assembling it in ramekin dishes. These need to be kept in the fridge in order to keep their shape. They are also freezable.